Home » News » December Newsletter – Santa’s Secret Closet, Holiday Organization Guide and MORE! December Newsletter – Santa’s Secret Closet, Holiday Organization Guide and MORE! 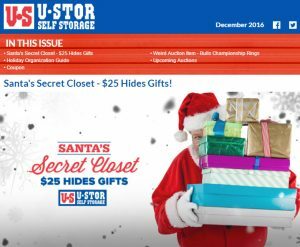 Santa’s Secret Closet Special – Through the month of December, U-STOR is offering a $25 special to new AND current customers. Use the storage unit to keep gifts safe from spying little eyes, de-clutter a room, or any other use you can think of. Holiday Organization Guide – The busiest time of the year is upon us. One minute you’re humming Silent Night while casually picking out a box of Christmas cards and the next minute – BAM – December is here and it wants all of your attention. Let us help you get organized with a week-by-week guide to help you dash through the remainder of the season faster than a one horse open sleigh. 15% Off Boxes and Gift Wrapping – You NEED boxes. We HAVE boxes. Visit any one of our six Wichita U-Stor locations and Maize U-Stor to check out the wide variety of sizes.